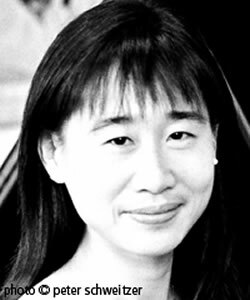 An adventurous musician, Esther has performed many young composers’ works (such as Garrett Byrnes’ Concerto for Piano and Chamber Orchestra and Derek Bermel’s Tied Shifts for Flute, Clarinet, Violin, Cello, Piano and Percussion), as well as works by lesser-known composers (such as Fanny Mendelssohn’s Piano Quartet) in addition to the standard repertoire. In recent years, Esther has been programming complete cycles of works. To date, she has successfully performed cycles of Beethoven’s piano trios, violin sonatas and cello sonatas. The upcoming season will feature cycles of Schumann’s piano trios, violin sonatas and cello-piano works. Esther is a faculty member of Longy School of Music of Bard College and New England Conservatory’s Preparatory and Continuing Education departments. She holds a double Master’s Degree in Piano Performance and Collaborative Piano from New England Conservatory, where she studied with Patricia Zander and Irma Vallecillo. Honors received include fellowships from International Institute of Vocal Arts in Italy, UCLA Song Festival, Aspen Music Festival, Music Academy of the West and Yellow Barn Music Festival. Esther is also a member of the New England Conservatory Alumni Council.